I woke to some strange noises outside. Some voices—and a fire crackling. Coming to my senses, I remembered where I was: sprawled out in the back of a rental vehicle next to my wife in the Utah desert, over 1,000 miles from our home in rainy Seattle. Our group of friends, who had the energy to stay up later than we did, were laughing around the bonfire we had started at dinner a few hours earlier. With the warm glow of the fire, sleepiness soon drowned out the chatter, and I drifted back to sleep. Everything was good. Perfect, actually. 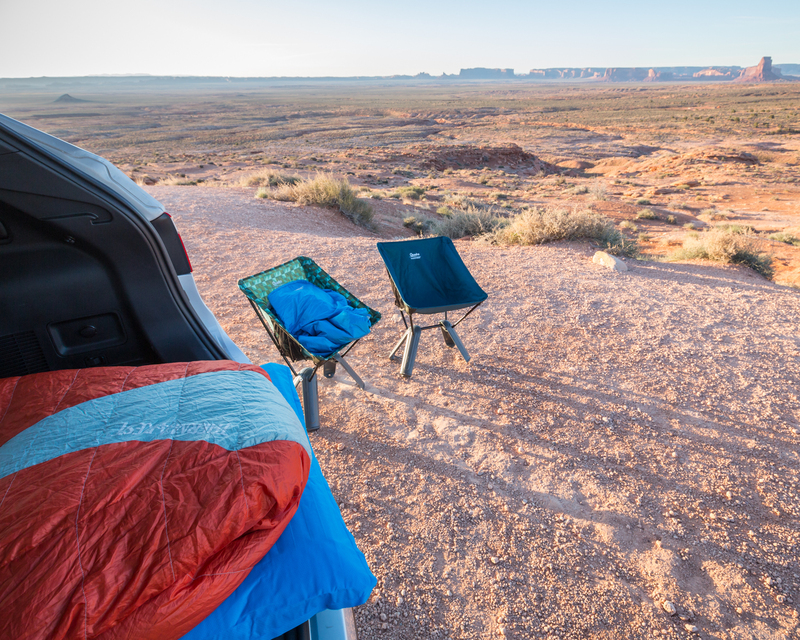 We were road tripping through southern Utah, and car camping out of our SUV rental. After some trail running in Monument Valley and hiking in Arches National Park, we found ourselves in the Moab area. Driving several dusty miles off the highway, we found the perfect little spot the middle of nowhere, and set up for the night. 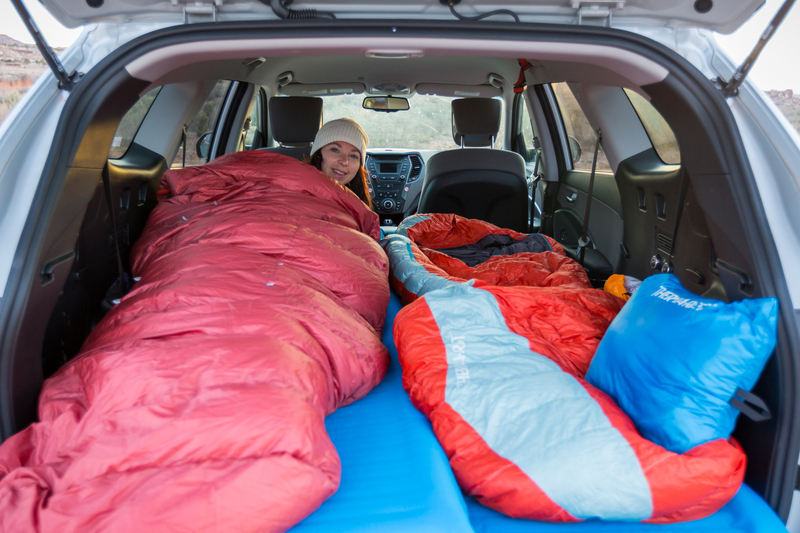 Before you go, whether you’re driving your own vehicle or planning on renting, make sure there’s enough flat space in the back of the vehicle to fully lie down with your sleeping pad and bag and any other gear. Most SUV’s back seats fold down, but not all fold down completely flat. Also consider getting a vehicle with four, or all-wheel drive. Access to the backcountry via rough roads can open up an amazing world of possibilities that most people drive past without stopping. I’ve car camped in a number of settings, and it’s definitely nice when the group has a lockable rooftop box. It provides extra storage for when you’re on the road and, more importantly, when you need more space to sprawl out in the vehicle at night. And a lockable rooftop box can be a safe way to store valuables, whereas the vehicle’s interior is visible through the car windows. Finding the right spot to set up your camp is also key. Do some research beforehand, and find a place that is safe, scenic and ideally free. Certain areas in the national forests provide just that. 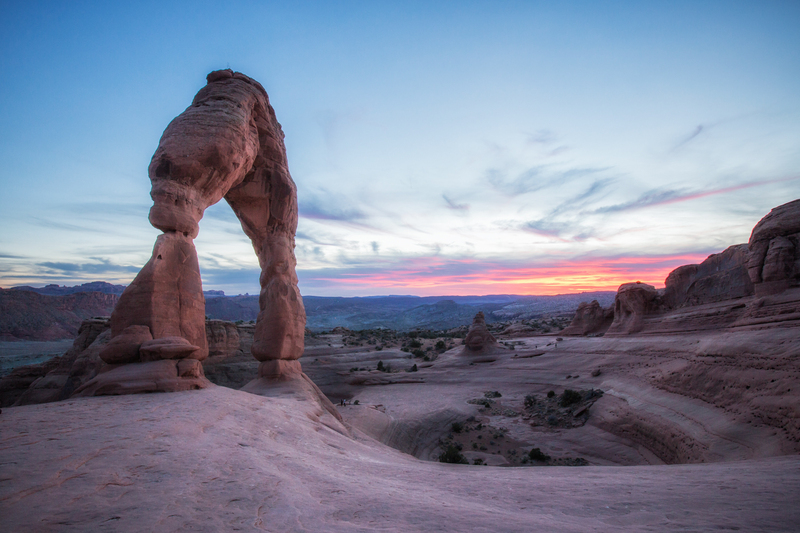 Also, in Utah and the Southwest, there is plenty of land owned by the bureau of land management available for camping. Regardless of where you end up, be sure to respect the land and practice leave-no-trace ethics. 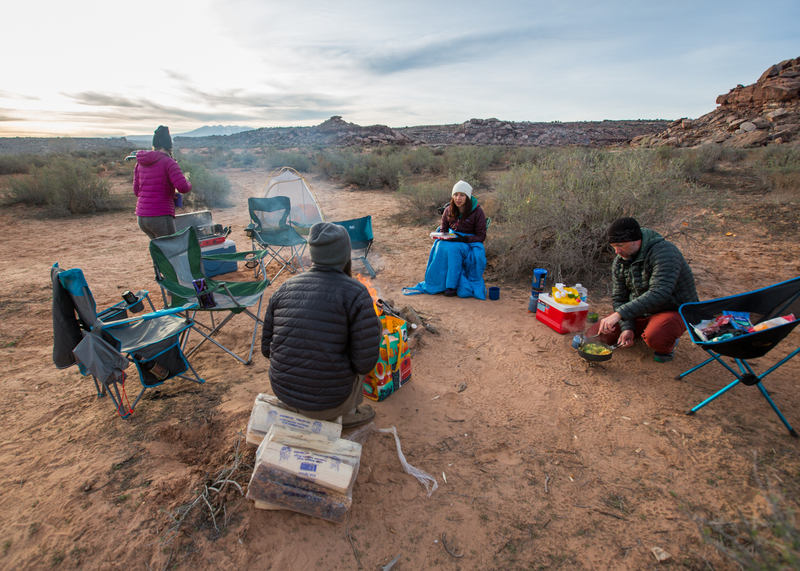 Embrace the benefits of car camping and bring all of the extra comforts that usually stay at home when you backpack or tent camp in the backcountry. Bring a big, full-size pillow. And add a tech blanket for some extra coziness. When car camping, weight and space is less of an issue. So there’s no need to resort to basic backcountry meals, snacks, and drink. Go all out and make a feast. Eat, drink, and be merry. Feel like pancakes for breakfast? Bring the heavy frying pan. Too few ounces in your 8-ounce flask? It’s okay to bring the whole bottle to share with the crew around the campfire. 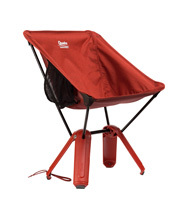 When packing all of these extra comforts, foods, and drinks, don’t forget that you’ll still be in the great outdoors. Remember to bring the essentials, including first-aid supplies, headlamps, sun protection, and plenty of water. 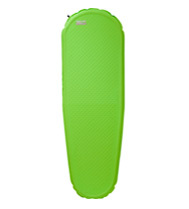 Accidents and emergencies are not limited to when you’re miles away from car with only a pack and a tent. No car camp is complete without a campfire. 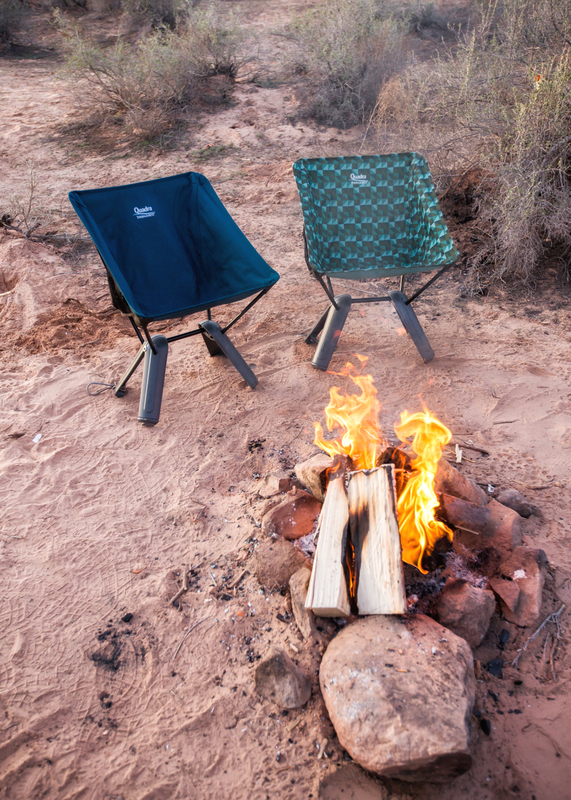 If you’re in an area where campfires are allowed, bring the camp chairs, marshmallows and some extra firewood to last the night, and let the good times roll. After the food and drink is consumed and the fire is down to glowing embers, it’s time to get some shuteye. 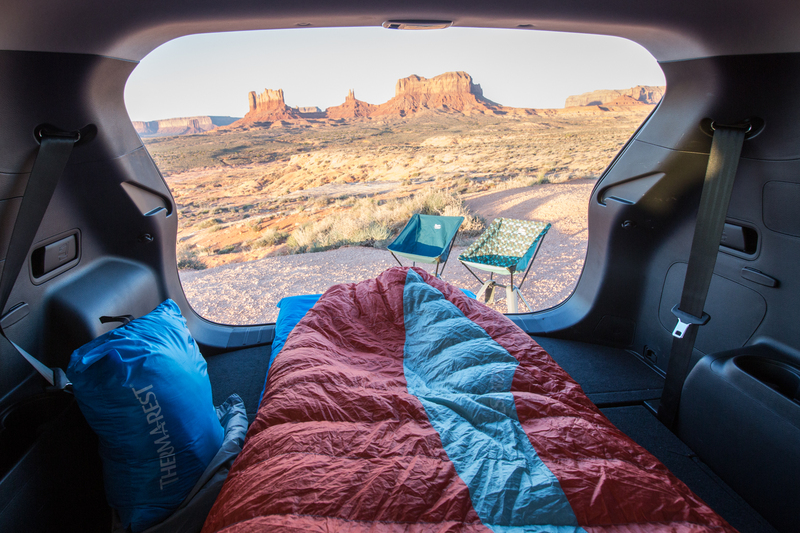 Before you lay out on your sleeping pad and close your eyes, make sure your vehicle is ventilated so you can wake up in comfort the following morning. This can be as simple as cracking a window or two. 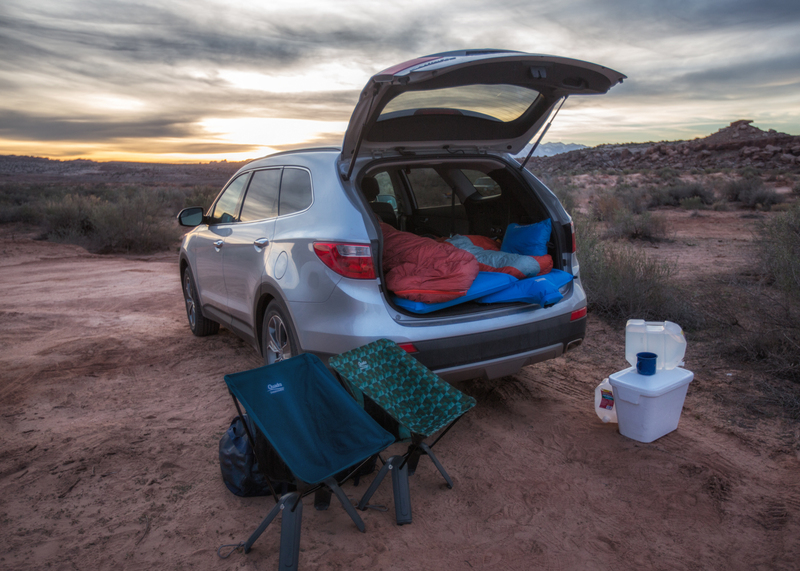 Especially in the desert, the night air can be chilly but dry, so even consider keeping the rear door open all night if you have enough warmth. If there’s a chance of rain, consider bringing a waterproof tarp that you can drape over the top of the vehicle and any cracked windows, preventing the rain from entering but keeping the air flowing. I love being outdoors, without exception. 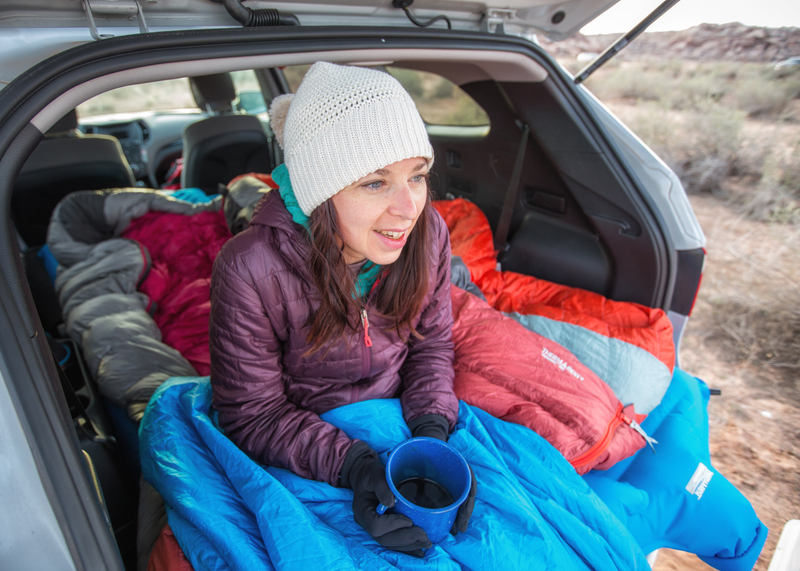 I’m often backpacking, tent camping, and bivying right on the ground—but sometimes car camping is the perfect accommodation for a trip. After a long day of hiking, climbing, trail running, or whatever activity that gets your heart pumping, you often want a comfortable home base. At the same time, you want to stay outdoors all hours of the day and night. You can strike that perfect balance while car camping. In the end, the road trip and car camping experience is a special one. It’s life on the road, even if only for a short while. It embodies an ongoing journey and the curiosity of what tomorrow might bring.